This luxury apartment is fully equipped with microwave, dishwasher, washer/dryer, ceiling fans, and is fully air conditioned. It consists of two bedrooms and bathrooms with one ensuite(marble and ceramics). The living room and balcony overlook the 4th green of Club Rockley's golfing range, and enjoys the trade winds year round. Close to beaches, supermarkets, and all the other South coast amenities. Golfing and tennis are extra and may be booked through the resort facility. A maid is provided twice weekly and is included in the rates.24 hour security on resort grounds. Luxury tiled, well lit bathrooms with medicine cabinet/mirrors. Sleek, modern fittings and low flush toilets. Recently renovated with sleek quartz countertops and glass backsplash. Sink view out to Pool and opposite view onto living room, balcony and golf course. Six seater Rattan dining table with cushioned dining chairs. A credenza stores placemats and trivets. Overlooks the 4th Green with four seater table and chairs and pool towel rail. Four tennis courts are situated within the resort and can be reserved for a small fee. Spacious with umbrella tables, chairs and loungers, maintained on a daily basis. 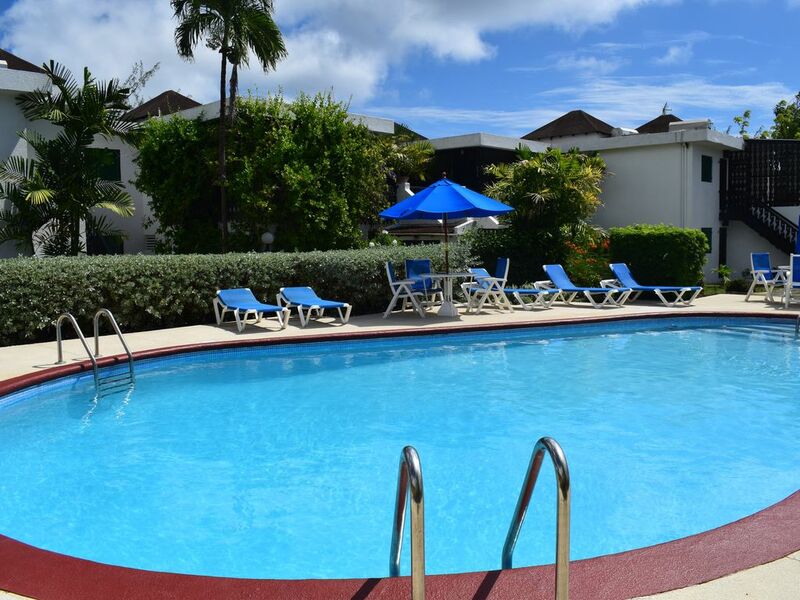 Rockley Resort offers a tranquil and tropical setting amidst the beautifully landscaped golf course while still being centrally located and close to all amenities on the beautiful south coast of Barbados. Rockley resort is set in an 9hole golf course interspersed with clusters of 2 and 3 bedroom apartments , each cluster with its own pool. 5 minutes walk to all amenities, Supermarkets, banks, post office, gas station, bars,Hastings ,Worthing and Rockley beaches (access to South Coast Boardwalk). Numerous and varied dining options from fast food to fine dining. Close to St Lawrence Gap , and the UNESCO world heritage site at the Garrison Savannah and Historic Bridgetown.